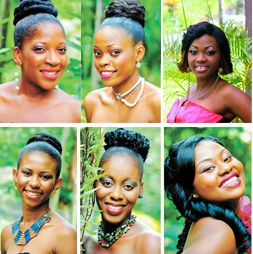 The six are: Kizzy-Ann Black of Calder, Miss CMT Out ah Trouble Family; Aleisha Campbell from Belair, Miss Catoâs Heavy Equipment; Lori Jack from Stubbs, Miss Touch of Pearl; Angell John from Freeland, Mesopotamia, Miss Red Dog Garage; Angella John (no relation to Angell) from Evesham, Miss PKF/KDLT and Latoya Pitt from Carriere, Miss Sunsail. They are expected to make four appearances, including an introduction in costumes provided by Ahdrenaline Mas Camp, swimwear, talent and evening wear/interview. Lyn-Marie Nichols, member of the Pâtani Carnival Committee, said the young women have been preparing themselves since March. âWe train our girls to the best of our ability, and patrons can come out and relax and enjoy the Miss Pâtani 2013, because it is going to be a show with a difference,â she said. Every year, the organizing committee does its best to step up its game and, according to Nichols, this year is going to be no different. âThis year, we are going to ensure that patrons get their moneyâs worth,â she added. The night is expected to feature performances by various guest artistes, and the final walk by Miss Pâtani 2012, Leonney Bentick. The public will be given the opportunity to get a glimpse of the six contestants tomorrow, Saturday, with a planned motorcade, which is expected to leave the Victoria Park around 12:30 p.m. making two laps around Kingstown before heading to the Marriaqua Valley. Immediately following the crowning of the new Pâtani queen, revellers will take to the streets for JâOuvert, followed by the kidsâ party, beginning at 1:30 p.m and the festivities climax with the street jump-up.